The 5 series will go on sale in March, priced from 39.950 euros in Germany. STUTTGART -- BMW's appetite for controversial design may have waned since the heights of former design boss Chris Bangle's oft-derided flame surfacing stratagem. But it shows no sign of fading completely, as the new sixth-generation 5-series shows. Codenamed F10, BMW's midsize sedan is restyled and reengineered in a bid to keep it ahead of key rivals such as the recently renewed Mercedes-Benz E-class and the Audi A6. Although its look is not nearly as arresting as its direct predecessor, the new 5-series has again strayed into controversial territory with an appearance that picks up on the design language first unveiled on the latest 7-series, but with added flourishes that BMW's new design chief, Adrian van Hooydonk, says are aimed at providing added sportiness. "We've attempted to match elegance and sportiness together in equal measure to give a unique personality. But at the same time, we've been careful not to stray too far from traditional 5-series visual qualities," he said. Doing away with move toward hybrid construction, which saw the front end of the old 5-series fashioned completely from aluminum, the new model returns to a full steel unibody. The body is a combination of steel and aluminum -- the latter used for the hood, doors and front fenders -- and is claimed to be 55 percent stiffer than before. Although it's not official just yet, BMW also plans to add a hybrid to its 5-series line-up. The new model, to be called the ActiveHybrid 5, is planned to make its public debut as a concept at the Geneva auto show next year before going on sale in early 2011. 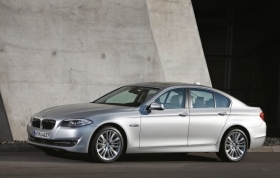 The new 5-series will be have more hi-tech features than the current model. Added to the high level of equipment available on the outgoing 5-series such as blind-spot warning, land-departure warning, heads-up display and night vision with pedestrian detection is a new parallel-park assist system, a distance-warning system which uses sensors to provide a top-view image and frontal collision warning that automatically applies the brakes. The 5 series will go on sale in March and will cost between 3 percent and 5 percent more than the current car depending on the model, with prices starting at 39.950 euros in Germany. The 5 series is built in BMW's factory in Dingolfing, Germany, along with the 7 series. It shares a new vehicle architecture with the 7 series.